Individual cells are the micoscopically smallest functional units in living organisms. Their microscopic dimension makes it difficult to analyze the dynamics of a variety of cellular processes and tracking changes in the chemical composition of the intra- and extracellular fluid. This requires sophisticated and analytical techniques with high sensitivity and spatio-temporal resolution. A powerful tool to analyze the manifold chemistry in the close proximity of and in single cells are moveable ultramicroelectrodes (UME). Compared to conventional electrodes, they show exceptional sensitivity for the detection of redox-active substances, rapid response times and total tip diameters in the micrometer range (range of diffusion layer thickness). These features make them ideal for the analysis of the chemical environment and the activity of living cells. UMEs can be used to monitor molecular secretion events by amperometry or voltammetry. Generally, electrochemical detection can be done by either needle-like UMEs or by UME arrays of many individually voltammetric sensing units. 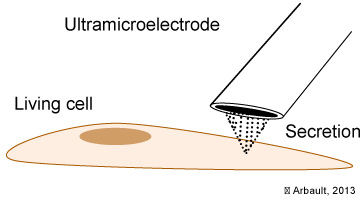 Schulte, A. and Schuhmann, W. (2007) Single-cell microelectrochemistry. Angew Chem Int Ed Engl., 46(46):8760-77.